Gulsha, the suffering mother of Sanobar accuses Malom Zafar (district chief) and Commander Mehmood, a local warlord, to be linked with the crime. Mohammad Zahir Zafari, head of the human rights office in Kondoz says, his office was threatened a number of times not to follow the case. 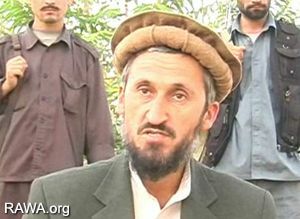 Malom Zafar Shah, the District Chief, a warlord of the "Northern Alliance" is involved in many such crimes. 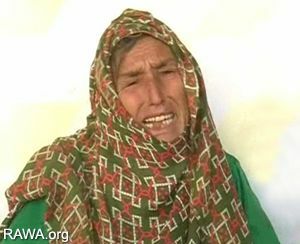 Sanobar, 11-years-old daughter of Gulsha, an Afghan widow, has been abducted, raped and then traded in exchange for a dog by warlords in Aliabad district of Kondoz province in North of Afghanistan. The suffering mother, while crying, says: "a month ago at 11 o'clock of night armed men entered my house and after beating and threatening me by gun, abducted my only daughter." She accused the district chief Malom Zafar Shah and a powerful warlord Commander Mehmood to be responsible for this crime. Gulsha says later it was found that her daughter has been raped and exchanged with a dog and a sum of money to another person but her whereabouts are still unknown. Both Malom Zafar Shah and warlord Mehmood are from the "Northern Alliance" and members of Jamiat-e Islami Afghanistan led by Burhanuddin Rabbani (currently member of the Parliament). They have a long record of such crimes and brutalities against people of Kondoz. Malom Zafar has been appointed as district chief directly by Qasim Fahim the former defense minister and vice President and now member of Senate. 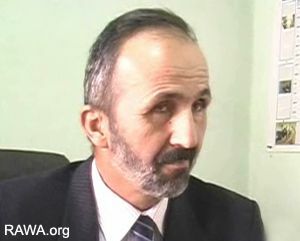 In an interview with Ariana TV, Malom Zafar rejected all charges against himself and Commander Mehmmod telling "no Jehadi brother is involved in such crimes." Mohammad Zahir Zafari, chief of the human rights office in Kondoz says, they have tried since a month to find the child but police is also unable to do anything as powerful people have link to the crime. He also exposed that his office was threatened a number of times to stop following of the case. Pajhwok Afghan News quoted Zahir Zafari on Nov.7, 2006: "The only person responsible for the abduction of Sanobar is the warlord Mehmood, who exchanged the girl with a dog which he got from Nimatullah and then sold it for 150,000 Afghanis (US$3000)." Such crimes happen on daily bases in Kundoz and other parts of Afghanistan where warlords have established jungle law and have all the key positions in their possession. Unfortunately only few of such cases find its way to the media, most journalists are too afraid to report it as it can have dangerous consequences for them.